The struggling brand smart grew more than any other brand, at least on Facebook where their global page had a 109% gain of 25,821 fans while only selling 327 cars in the United States in July. Therein lies a problem that is growing in this report. Several European brands have created USA based pages, smart being one of them. 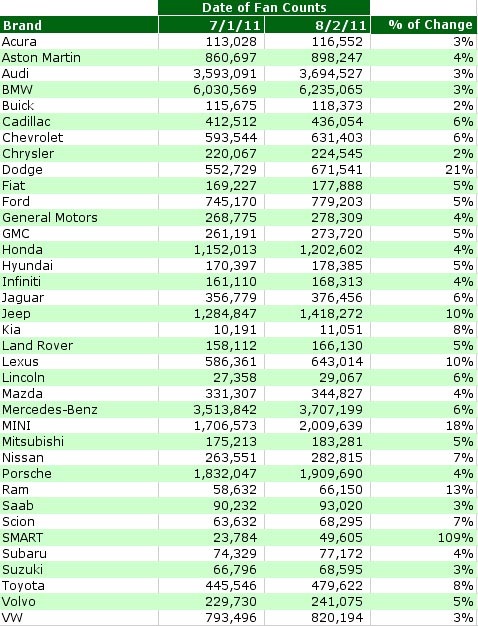 BMW, Audi, Mercedes, and Volvo all have USA pages now and perhaps it is time to modify this report to show a United States view of fan growth by brand. My only issue with switching to the USA pages is that the USA pages have much smaller budgets, lack a lot of the organic growth that happens. Why? Because people looking for a brand's Facebook page are far more likely to click on the one with the most fans and the cleanest page name. You follow BMW, not BMW USA especially when you see all of the fans and activity on the BMW page. This is a behavior I've seen for years on Facebook and so I tend to focus on the primary brand page. With so many USA pages, is it time to switch this report to a USA focused report, especially considering I don't track non-USA brands like Peugeot or Citroen. Let me know your thoughts. Should I switch to this tracking the USA focused fan pages? 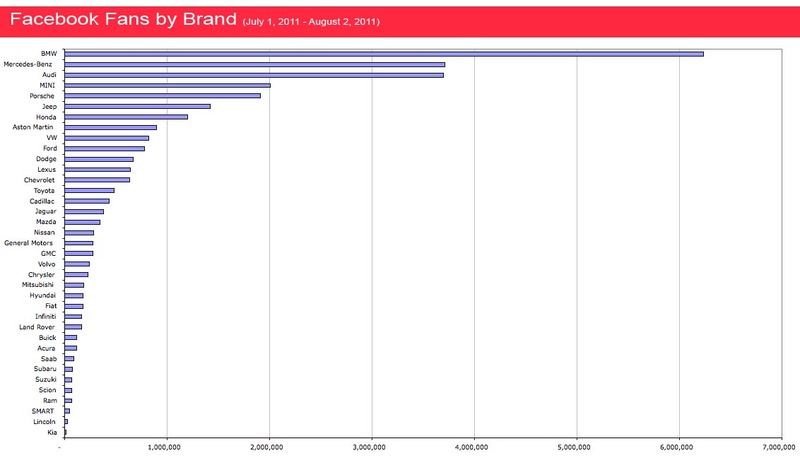 One other thing of note last month is Mercedes-Benz overtaking Audi's page in the race for fans. One of the big pushes for the brand is their "Mercedes-Benz & Friends" event coming August 25-28 bringing together all international official Benz clubs. 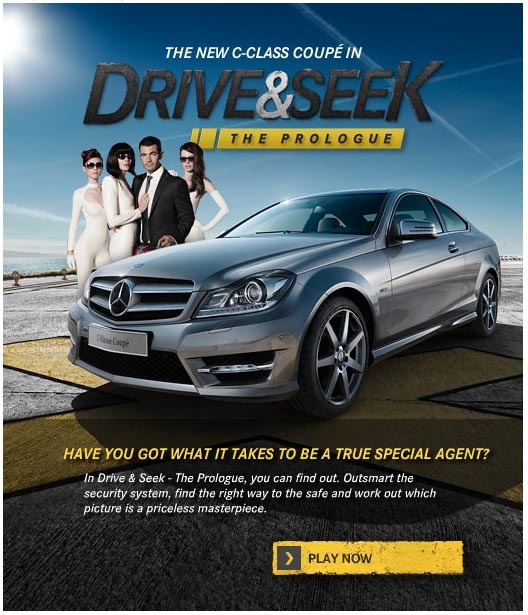 But most of the fan growth likely came from the marketing efforts of their Drive & Seek game helping to launch the all-new Mercedes C-Class Coupe. The game is centered around the player being a special agent who is trying to outsmart a security system. I would go all USA. 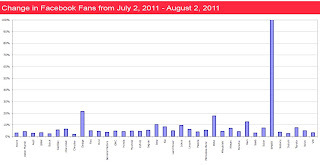 I try to separate the US when it comes to my FB analysis blogging. The simple reason is reality. People hear Facebook has 700mil accounts. Yet in reality 140mil visitors from the US who showed up only once per month. And then of those only about 22 million are active each day based on Compete's numbers and the Facebook Stats Page. So I can tell clients today realistically you have a pool of 22 million you can possibly reach. So depends on the goal of your blog Chris. 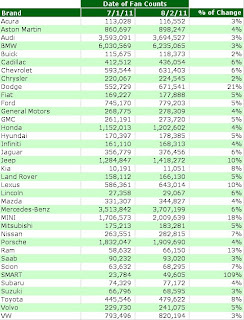 Cars are global but insights often need to be more local. 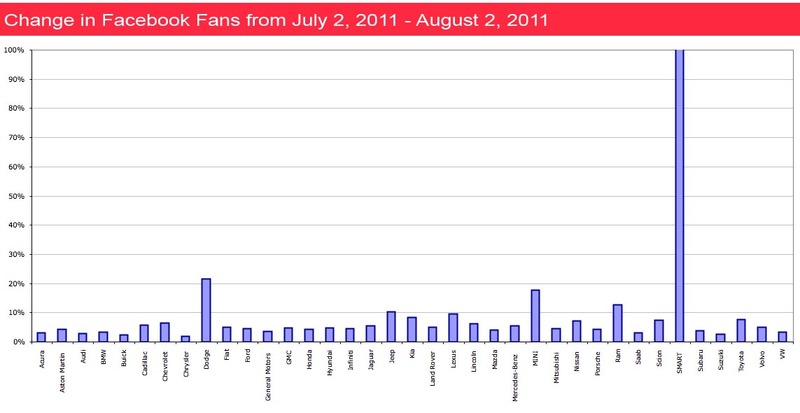 And as discussed on the beancast does having Fans in places you can not sell to benefit or should they be ignored? None Bail Bondsmen CEO is one Florida’s brightest Bail Bonds Marketers.